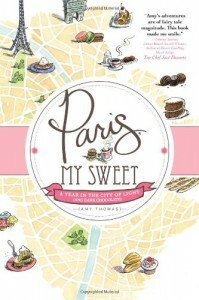 I had high hopes for this book because I love all things sweet and have always wanted to go to Paris. (The closest I got was the Charles DeGaulle Airport.) I was able to over look this line: "...but it wasn't long before we became inseparable and I got to learn more key traits from my corn-fed friend from Iowa." Was it necessary to add that bit about corn??? I realize it's a book about food, but still it annoyed me. When I got to this line when she talks about her parents traveling to Europe for the first time to visit her and her brother: And being devotees of the Fox News channel, I knew leaving U.S. soil for the first time (especially for France, Zut Alors!) made them more then a little anxious. I'm not a fan of that channel, but my parents watch it and I have on occasion. It just bothered me that the author threw that remark in. Why blame a news channel for them feeling anxious? Why not just say they were anxious about leaving the country? The descriptions of the bakeries and chocolate shops were wonderful, and I can tell that the author really has a joy for all things sweet. I loved seeing her struggle to adjust to life in Paris, and her descriptions of New York City. Both of my sisters have lived in NYC (the village and Tribecca) and adored it, so I loved seeing the city in a different way. It's unfortunate that I let one line ruin an otherwise delightful read, but c'est la vie.